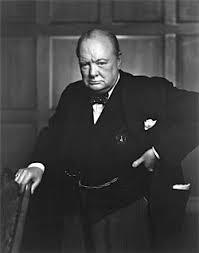 Sir Winston Churchill (1874-1965) was a politician, a Prime Minister; a writer; a notable orator; and an indomitable war leader during World War II. During his long life, he was given almost every honour his country (and others) could bestow: Knight if the Garter, Companion of Honour, Order of Merit, Nobel Prize for Literature, Fellow of the Royal Society, Lord Warden of the Cinque Ports and an Honorary Citizen of the United States, amongst others. 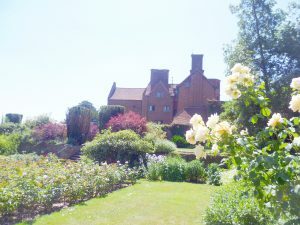 This post looks at his private country home – Chartwell in Kent. He bought Chartwell in 1922; it was the place where he brought up his children and where he felt most at home. It was here he could relax from affairs of state and indulge in his passion for painting. It was here that he died. 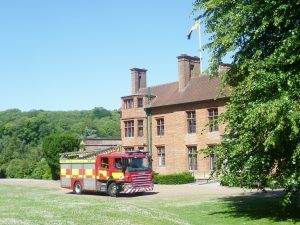 Chartwell: the west front. The fire engine was on a routine visit; I liked the contrast it made. The flag flying above the house is that of the Lord Warden of the Cinque Ports, a post dating back to the 12th century. 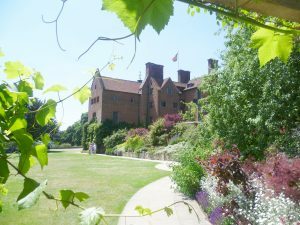 I have long wanted to visit Chartwell, now run by the National Trust. There’s something about seeing the home of a National Hero which allows you to see the owner more in the round, and I was surprised to see that the house was not, actually, particularly distinguished, being a large, somewhat lumbering, Victorian building, with occasional traces of its 16th century origins. 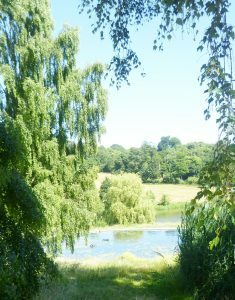 It is set in eighty acres of woods and farmland and is surrounded by extensive gardens and a number of specially-constructed lakes and it underwent a good deal of alteration in the 1920s after Churchill bought it. The back of the house: you can see that it’s built on a slope. The visitor first sees the house from the back; you walk past the rock garden and water garden, then up some steps to Lady Churchill’s rose garden, and then across a lawn with terraced planting on the right. Eventually, you arrive at the front of the house. The ground floor library; the furniture is more Country House than Stately Home. The first room you see is the library. 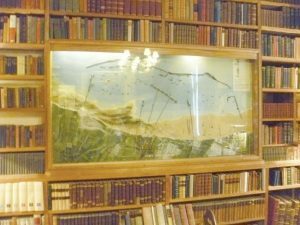 Many of the books here were written by Churchill himself. He was not a stupendously rich man. His grandfather may have been the Duke of Marlborough, but Churchill was the son of a younger son; his personal inheritance was not huge. He had his Parliamentary salary but most of his income came from his writing, from his youthful journalism to his later histories and biographies. 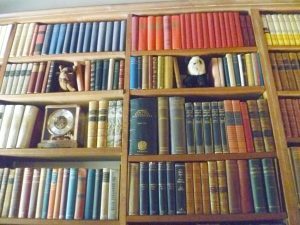 Most of the many books in the house are still in their original positions – and there are books everywhere. A wall of books in the library. The inset relief model shows one of the Mulberry harbours towed across the Channel to play an essential part in the D-Day landings on 6th June 1944. The drawing-room is also on the ground floor. Note the two alcoves full of books. Again the sofas and armchairs are comfortable rather than antique. This room juts out into the garden with windows on three sides. There is a magnificent Monet of ‘Charing Cross Bridge’ on one wall. However, the picture which has pride of place over the mantelpiece is a portrait of Colonist II, Churchill’s favourite thoroughbred, by Raoul Millais. Lady Churchill adored flowers. 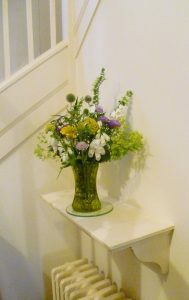 This vase is on a small ledge by the staircase. Lady Churchill’s fondness for flowers is evident everywhere, and the National Trust keeps up the tradition and makes sure that all the rooms have flowers in them. 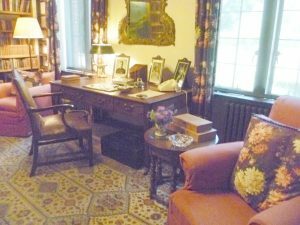 Churchill’s study, on the first floor, is in one of the oldest parts of the house. Some of the roof timbers date back to the 16th century. 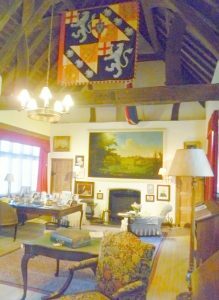 The height of the roof allowed Churchill to hang up a replica of his garter banner as Knight of the Garter. Wall of books in Churchill’s study. This was the room where Churchill spent most of his time. His speeches were planned and drafted here. He wrote 43 books in all, including History of the English-Speaking Peoples; a biography of his ancestor, the first Duke of Marlborough; and the six-volumes of his history: The Second World War. As he once remarked: History will be kind to me, for I intend to write it. If you look carefully, you can see that there are gaps in the books filled by a child’s soft toy. These mark the places where he’d taken out a book. Churchill was famously insomniac and his secretary was required to be ready for work at any time, day or night. (I hope the pay reflected the unsocial hours!) His bedroom is not open to the public. 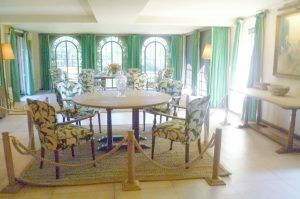 The dining-room on the lower-ground floor has recently been renovated. It is an east-facing extension designed by Churchill’s architect with the brief to design a room to accommodate twelve guests. It was deliberately too small for grand dinner-parties – but the Churchills didn’t like formal dinner-parties or long-weekend house parties, preferring gatherings of close friends or family. Occasionally, a special guest, like Charlie Chaplin, was invited to ‘dinner and an overnight stay,’ but they left the following morning. Of course, as Prime Minister, Churchill had the use of Chequers as his official country residence and any work-related formal events could be hosted there. Though an invitation to Chartwell also allowed Churchill to talk ‘off the record’ to various important people when necessary, from American President Harry Truman to Lawrence of Arabia – whose Arab robes thrilled Churchill’s children. There is much to see outside the house, too. Approaching the house from the car park, the visitor passes the golden orfe pond with its large stepping stones so that Churchill could get to the special chair and table on the far side. Here he painted, which was obviously something very important to him. 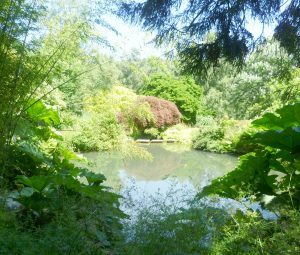 The pond was one of his favourite spots and he completed many pictures of goldfish and golden orfe. Towards the end of his life, he still took pleasure in feeding the fish and watching them. 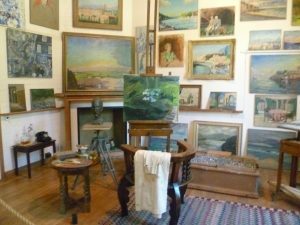 Churchill used to paint in a room in Chartwell itself – and drips of oil paint of the carpets were not unusual. Eventually, in 1950, Lady Churchill persuaded him to extend the old Stable Cottage on the estate and turn it into a proper studio. His paints, easel, chair and other painterly necessities – even his spectacles – are now here. Many of his 500 canvasses are up on the walls. This picture is of one of the garden lakes with black swans. Churchill had embarked on the creation of the lakes in the late 1920s and it proved a difficult job with a number of technical problems. However, eventually it was done and he then chose several sorts of waterfowl, including the famous black swans who he hoped would make it their home. Churchill’s role was, undoubtedly, crucial in guiding the nation through the dark days of World War II; keeping it together with his oratory – which told the truth, (I have nothing to offer but blood, toil, tears and sweat’) no matter how difficult things were. As well as directing the war effort to ultimate victory, which must, at times, have seemed against the odds. He was given a state funeral in London. I myself, as a teenager, queued to see the catafalque bearing his coffin, draped with the Union Jack, flanked by a soldier, a sailor, an airman and a royal marine, in Westminster Hall before his funeral. I wasn’t in the country for his funeral, but I do remember it from newsreels. Lovely post. It looks such a comfortable house, just how one would have liked to live in the days when it was possible. Very nostalgic. I think you are right, Elizabeth, about the comfort. You wouldn’t have to worry about flopping down into an armchair in case it was some priceless antique! The big plus for me was that he obviously loved having books around – even if a lot of them were written by himself!